This is "The Pink Pixie & The Blue Bobbin". These whimsical characters sit together on a moss covered log cut. 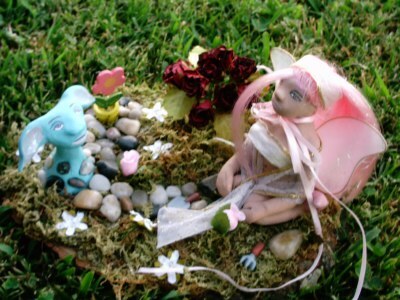 A pebble path leads from a beautiful and realistic rosebush, past the Blue Bobbin, right to the Pink Pixie. The Pink Pixie is tending her garden path with tiny tools (a spade and a rake). 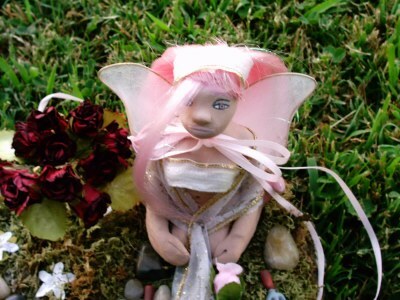 The Pink Pixie has glittering pink hair with matching painted eyes. Her sheer shawl makes a lovely accent to her matching white top and headband. She has white and gold nylon wings. And she is tied off with a beautiful pink ribbon bow around her neck! The Blue Bobbin is popping up out of the ground to say "Hello" and perhaps help Pixie in her garden. He has stones embedded and glued (for added security) down his neck and into the ground. He is hand painted, he has brown eyes and blue skin. The insides of his adorable drooping ears are painted a glittering pink to accent The Pink Pixie! There is even a flower on a spring bouncing around near him, for added whimsy!